Vaccines are one of the main reasons why we enjoy a relatively disease-free and extended life span. The others are the creation of antiseptics and antibiotics. Before the invention of vaccines, people died of diseases such as Pertussis, Tetanus, Measles, and were crippled by Polio. Widespread epidemics would kill millions of people and wipe out entire towns or villages. Fears about vaccines come from mistrust of authority figures (physicians), governmental agencies (CDC), and “big business” (pharmaceutical industry). This mistrust comes from the belief that an individual’s interest is overlooked for governmental or monetary interests. This mistrust is magnified when there is a lack of understanding of diseases, our immune systems, how vaccines are produced and tested, and vaccine side effects. Communicable diseases are diseases that are transmitted from person-to-person; sometimes there is an intermediate source such as a contaminated surface or food. Our body comes into contact will hundreds or thousands of new germs every day. Some can make us very sick and others are benign like the beneficial bacteria in yogurt. We become ill when our bodies are exposed to certain foreign germs, our body’s immune system creates antibodies to fight the bacteria or virus, and our body raises the internal temperature to kill the germ, which creates a fever. Most of the time we get over the attack on our body quickly and we’re back to normal in a few days, but there are germs that can cause severe reaction to our bodies and damage key organs. For example, Measles can cause a mild rash, red eyes, and some body aches and fever; however, it can be very severe and in 1 out of 1000 individuals with Measles, it can cause Encephalitis which is an inflammation of the brain which may lead to brain damage, coma or even death. With the creation of the MMR (Measles, Mumps, Rubella) vaccine, measles had been virtually eliminated from the United States in 2000; however there have been a resurgence of the disease because some parents have opted out on the vaccine. Worldwide measles kills several hundred thousand people a year. Myth: If most of the kids are vaccinated at school, then I don’t need to vaccinate my child because he will be protected. Fact: This is somewhat true but we live in an international country where people from all over the world come and they may be carrying a germ that you are not vaccinated against. Myth: Getting multiple vaccines such as the combination vaccines will overwhelm my immune system and cause side effects. Fact: Our body’s immune system is exposed to hundreds if not thousands of germs every day so a few more in a vaccine will not make any difference. Research has shown that giving multiple vaccines concurrently is safe. Myth: Getting the Flu vaccine can cause me to get sick from the Flu. Fact: The injectable flu vaccine is a killed-vaccine and cannot cause the flu. The nasal spray version is an attenuated-virus vaccine; there is an extremely low likelihood of getting flu symptoms with the live vaccine. Individuals who say the last time they got the flu shot, they got the flu shortly afterwards most likely were exposed to the flu around the time they got the flu vaccine. So the flu vaccine did not have time to take effect and they became ill. Vaccines come in different forms, a live-attenuated (weakened) virus or a killed vaccine. The live-attenuated vaccines are altered forms of the normal germ so when patients are given the vaccine, the body develops a mild reaction to the germ but the full blown disease is avoided and the immune system is stimulated to create antibodies against the virus. In a killed-vaccine, the germ is killed in the manufacturing process but the main components of the germ are still intact. The killed vaccine cannot cause any disease. These components are seen by the immune system and antibodies are created. In either type of vaccine live or killed, the immune system remembers the germ and if you are exposed the real germ, your body develops antibodies quickly to kill it off before it can cause disease. A part of the vaccine is the Preservative that the vaccine is stored in. In the past many of the multi-dose vials of vaccines were stored with mercury containing preservative solutions (thimerosol). There was fear that with injections of vaccines, that somehow this exposure to thimerosol would cause autism. Acute and chronic mercury poisoning does not produce the same symptoms of autism. In the 1990s, epidemiologists noted an increase in the diagnosis of autism. This may in part due to increased awareness of autism, better diagnosis, and the expanded criteria for autism spectrum disorders. But because of the public’s outcry against mercury containing vaccines, it was decided that to increase the public’s confidence in vaccines, that thimerosol be phased out by the early 2000s. However, the rate of diagnosis of autism has continued to rise even though thimerosol has been largely phased out. Myth: Injectable polio vaccine (IPV) can cause Polio. Fact: IPV is a killed vaccine and cannot cause Polio. The Oral Polio Vaccine (OPV) is a live-attenuated vaccine and is given in parts of the world where polio is still present. OPV is more effective than IPV but because Polio has been almost eliminated in the Western Hemisphere, OPV is no longer given. OPV can cause Polio in rare instances, about 1 in 2.4 million doses. Fact: There was a study in 1998 published in the British Medical Journal that linked MMR to autism by Dr. Andrew Wakefield. This study became the basis for the belief that MMR and vaccines caused autism. This led to a sharp drop in the number of MMR vaccines given to children in Britain; this resulted in an increase in Measles. The British Medical Journal had retracted the study in 2010 because it appeared that attorneys who were hoping to sue vaccine manufacturers paid Dr. Wakefield more than $674,0000; he falsified the medical histories to make the study show a link between MMR and autism. Dr. Wakefield lost his medical license as a result of this. Subsequent studies by other researchers have failed to show any link between vaccines and autism. Current research appears to point more towards a genetic link to autism. Myth: Thimerosol (mercury) in vaccines cause autism. Fact: Research has shown no link between Thimerosol and autism. In 2001 thimerosol was removed from all childhood vaccines. The rate of autism has continued to rise despite removal of thimerosol. Vaccines have been studied and tested extensively prior to being approved for general use by the FDA. They are one of the most effective means as to prevent infection. We now have vaccines that are targeting viruses that can cause cervical cancer. Although there will always be a segment of society that are distrustful of medical science, pharmaceutical businesses, and governmental agencies, the latest research in vaccine side effects have shown that vaccines are generally safe. As a Pediatrician and parent I tell the parents that I recommend and give all the vaccines to my own children. I would never give something that is dangerous to my own child. 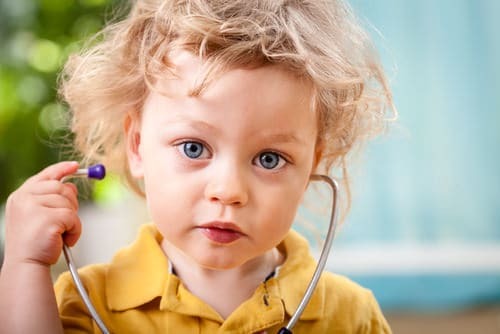 Parents in our practice are encouraged to ask questions about the vaccines and for those that are fearful of the number of vaccines given, we make accommodations to break up the vaccine schedule to decrease the number given on any one day.